Wantable - Full Sized Makeup Delivered Right to Your Door! I've seen a lot of marketing, facebook posts, and other social media chatter promoting getting a box of goodies each month. You can pretty much get anything: organic food, clothes, lingerie, wine, pet food, kids stuff, home products, makeup, jewelry, etc. You can usually get these in a monthly membership or buy month to month, of course a monthly membership is a better deal. I've steered clear of these, even though they seem really cool, mostly because I am already a clutter magnet. I see these monthly treasure boxes to be another opportunity for me to love something, then set it aside and watch it collect dust. I know, probably wouldn't happen if I got the food box right? :) It's like magazines, they SEEM like a good idea but when they come I look at the cover, flip through it and then toss it in a basket until it is time to take a load to Half Price Books where I get a whopping $1 for my trouble. However, Wantable sent me an email about receiving a free box if I would review the products. Why would I agree to get a free box from Wantable? Because it was free! I got to pick from anything they were offering; accessories, makeup or lingerie. I don't wear much jewelry/accessories; I have basic pieces I wear and a dresser covered with "costume" pieces I never wear. Lingerie seemed a little over the top and frankly I sweat most of the day at work, I don't need fancy lingerie. :) So I chose makeup. The process to pick a box is really easy. I decided what type of box I wanted. I picked the makeup so then the system goes through a series of questions to determine your skin type, level of interest in cool verses warm colors, and then in every category of makeup whether I liked or disliked a particular item (like nail polish). Then I waited for my box to arrive. Ofra loose blush in a pretty pink. I would not normally pick this color for me, it seemed too pink. But when I applied it to my cheeks I actually liked it a lot. It is great for a fresh, bright look. Tarina Tarantinom mascara. This is great mascara. It makes my lashes look great and it stays on. Eddie Funkhouser Hyperreal Pigment. This was a complete mystery to me. My thoughts were: wow, this is tiny thing and what they heck do I do with it? Thankfully the invoice that came with the package had great descriptions of the products with beauty tips. And you definitely don't need a lot of this to create a big impact. I used it on a night I went to the theater and loved the look. Just enough sparkle. I don't wear much make up since I'm in the hot room so much now so it has taken me some time to really try the products. I don't know that I am the target market for a monthly makeup box; I think I would be more interested in a yoga wear company that offered me yoga wear once a month. However, if you love makeup and love to try different things, Wantable offer quality products that will make you look stunning! How do you get stronger arms? Do push ups. I went to Gaia Flow today to get a little more arm and ab work than what we get in Bikram yoga. 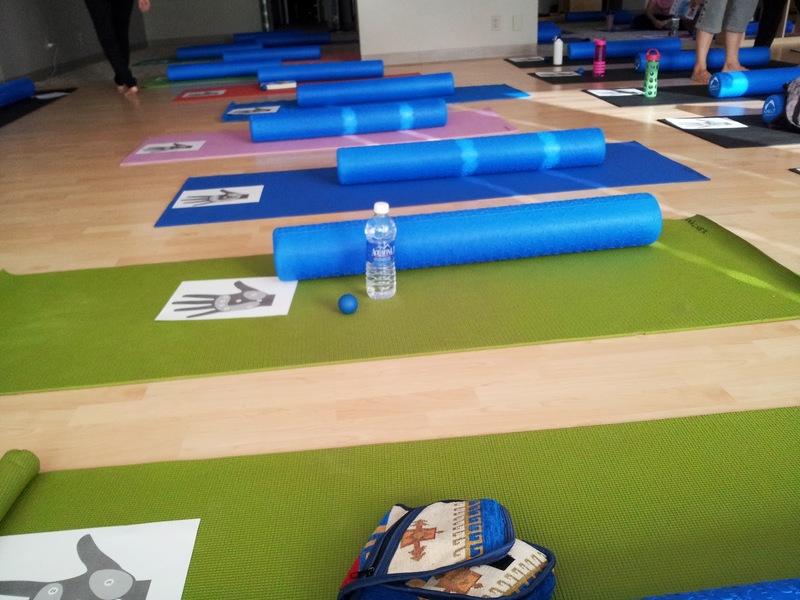 Gaia Flow has a "Weekend Warrior" class that is fairly warm, though certainly not as hot as Bikram yoga. They start the class with something like 300-400 ab moves. Seriously...300-400...I guess it depends who it teaching or what kind of mood they are in. Then they move into the good stuff, arm balancing, core working postures where even the fittest of people start to quiver before the teacher says to move into another posture. And if you aren't challenged, there are always variations of the posture..I stayed with the basics. I've been several times, they always stop after the ab work and discuss something the studio is "working" on or "focusing" on for the week. This week it was moderation. 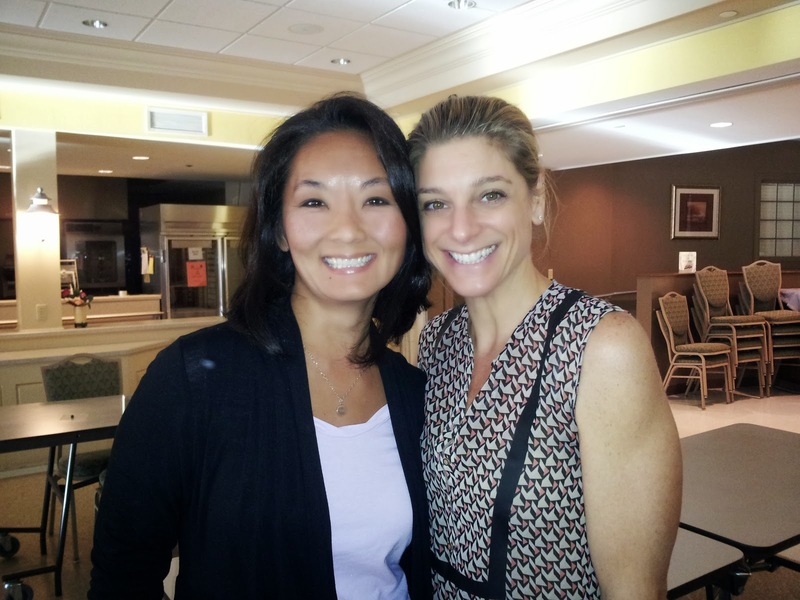 Moderation in your practice and in life; letting go of the ego and knowing your limits that day. I thought it was interesting and perhaps not a coincidence that I am participating in a moderation eating group and he referenced attempting to practice moderation in your eating...like only eating a few chips at a Mexican restaurant. And many of the things the teacher used as examples of moderation in yoga were things I try to communicate when I teach. Today in class I tried to practice moderation and not kill myself doing postures I am not totally familiar with or frankly, that good at. Downward dog is a favorite and a "go to" transition posture for just about everything we did today. After awhile my wrists started to hurt. I probably could have stayed in the postures but only to the determent of my ability to move my hands later. I opted to be safe and sit out a posture here and there, sip my water and wipe the streaming sweat off my face. Much of the arm balancing postures I couldn't do, arm strength is not something I have and though we do some arm work in Bikram, it isn't one of our top selling points. I know, you are wondering if I made it. It wasn't easy but I did 50 push ups. Ten at a time. Oddly enough, the last two "reps" I was able to pump out 4 solid without stopping, then a few more, then boom, was done. It was as if my arms got STRONGER as I did more. Shocker I know. I'm eager to see what tomorrow brings. I will either be able to do 100 or my arms might feel so weak I won't be able to lift myself off the floor. Check back tomorrow to see if I can still pull myself up to the computer to type. When step count doesn't matter. Finally got on the bike again and went around White Rock Lake. The weather in Dallas was just perfect for a quick jaunt around the lake. I was impressed with my ability to maintain a somewhat reasonable pace considering I haven't been on the bike since April. I debated I've been using a pedometer to track my steps and have been astonished at how inactive I am some days. Some days I barely make it to 2000 steps. The only time I've ever gone more than 10000 steps was when I ran 4 miles. I debated whether to run to get steps or do something different and ride. I decided it's more about being active which in the case of yoga and cycling don't include steps. So today, even though I'll barely crack 3000 steps, I feel pretty good about 12.5 miles on the bike. Earlier this year a friend of mine posted she had been to the Hand and Foot MELT training. I was intrigued so I looked it up and saw it was balls and rollers and what looked to me on initial review to be pressure point massage. I have been using a foam roller for years and recommend them often to yoga students, runners, cyclists, etc that are feeling pain. Based on my previous knowledge of foam rolling, reflexology and fascia I thought MELT would be a great compliment to what I already teach. An boy was I right! 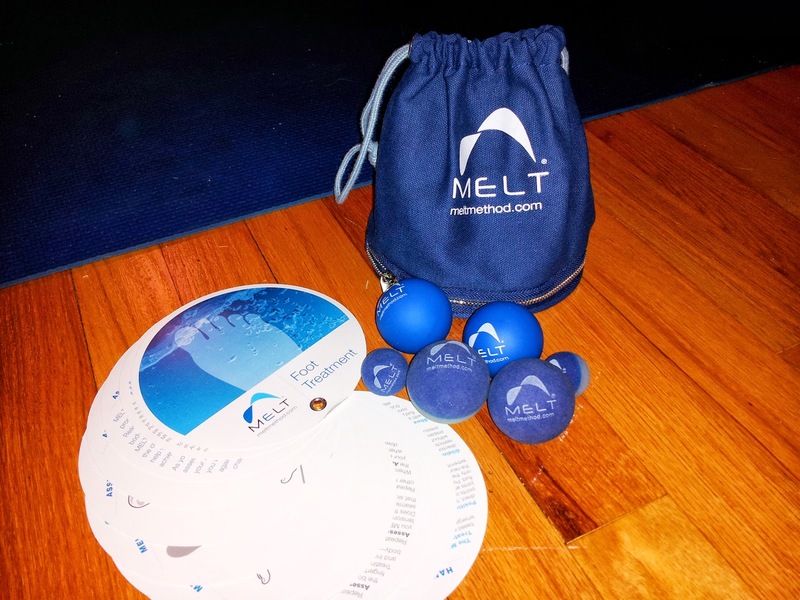 I just got back from the Hand and Foot MELT Training and am so excited to share how just a few minutes a day can help keep a person pain free. I mean, who doesn't feel pain every once in a while? I consider myself a fairly healthy person without a lot of pain but sometimes I get a crick in my neck or I get what feels like a knot in my muscles or when I am crazy enough to think I can run more than a 10K and my legs cramp up. Pain happens. Kind of like S**t. It just happens. But that doesn't mean you have to live with it. Here is a real example that happened to me this weekend. 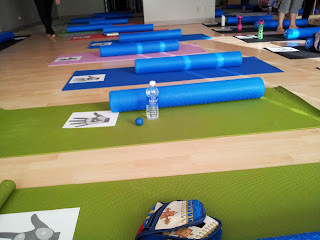 We were sitting for most of the two days learning about fascia, nerves, pressure points, etc. I was sitting at an angle I guess my body didn't completely agree with because once we took a break and stood up, I all the sudden felt a crick in my neck and had this pinching pain on the right side of my neck and shoulder area. When this happens at home I usually put some Tiger Balm on the area or get a neck roll, warm it up and put it around the area. I didn't have any of those things but we were about to do a foot treatment. We started with the left foot and after just a few minutes on the left foot I all the sudden noticed my neck didn't hurt anymore! No more pain! IN MY NECK? How the heck does pressing on my feet help my neck? The body is an amazing thing. The connective tissue, fascia, that is just below the skin is all over the body and is all connected, thus I am sure why it is called "connective" tissue. So you can effect an area not close to the feet by simply pressing on some points and sending fluid through the body. I vaguely knew this because of reflexology but I've never studied it and haven't done reflexology in response to a pain, it has always been as an add-on to a massage treatment. What was completely the ah-ha moment was when Sue said connective tissue can be dehydrated, even if you drink a lot of water and most of the time what we feel when we are tight or stiff is not so much about the muscles, it is dehydrated connective tissue. And dehydrated connective tissue can create pain in your joints, stiffness, reduced movement and imbalance. Want to learn more about MELT? Want to try it? Connect with me on twitter for news on upcoming classes, I'll be teaching classes in Austin and the Dallas area. If you are interested in more immediate help, email me at carolyn (at) bikerunyoga (dot) com. 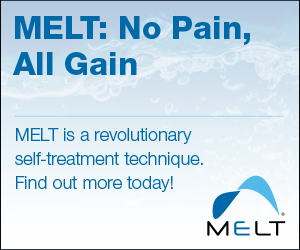 Purchase MELT products and Sue's new book! I took a full MELT Class the day before training started. This is super cool, bunion treatment! Sue Hitzmann and me after the training, MELTed and happy! Crofton Food Dehydrator makes great snacks for cheap! Crofton Dehydrator is on Sale at Aldi! Bike | Run | Yoga Shirts - Get Yours Today! Pay It Forward - Via Paypal! Help support Bike | Run | Yoga that's my tri and allow us, me, to continue to bring you interesting stories and antics about my adventures in the world of athletics through cycling, running an yoga. Namaste. I hope you find the information, stories and antics beneficial. All advice, tips and suggestions are my own opinions. I am just a regular, average person trying to live a more healthy lifestyle. Over the last few years I have achieved some amazing goals: a marathon, several half marathons, three yoga competitions and two century rides. If my experiences and stories help you achieve your goals too all the better. Please feel free to comment and follow. Happy reading! Namaste. Bike | Run | Yoga and "That's my tri" are trademarked and may not be used with out written permission.